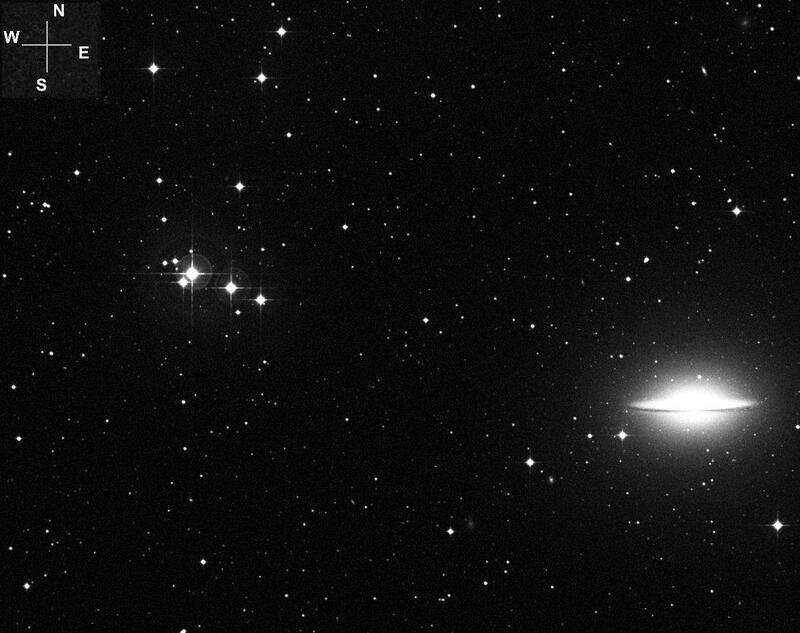 Σ 1664, the arrow at the left of this photo, streaks toward M104, the Sombrero Galaxy, which can’t be missed at the right! (STScI photo, east and west reversed. Click on image for a larger view). Well …….. it hasn’t quite reached the Sombrero yet, but — DUCK! — it’s on the way! The wonders of the heavens will never ever cease to amaze me and daze me. I thought I’d had a peek at the peak of perfection when I spied Σ 1659 at the heart of the dual triangles of Corvus (also known as the Stargate) — and then I came across Haas’s reference to Σ 1664 and M104, better known as the Sombrero Galaxy. And as amazing as this multiple star/asterism/galaxy is, what’s even more amazing is that it lies just a few photons from the dueling Corvus triangles. 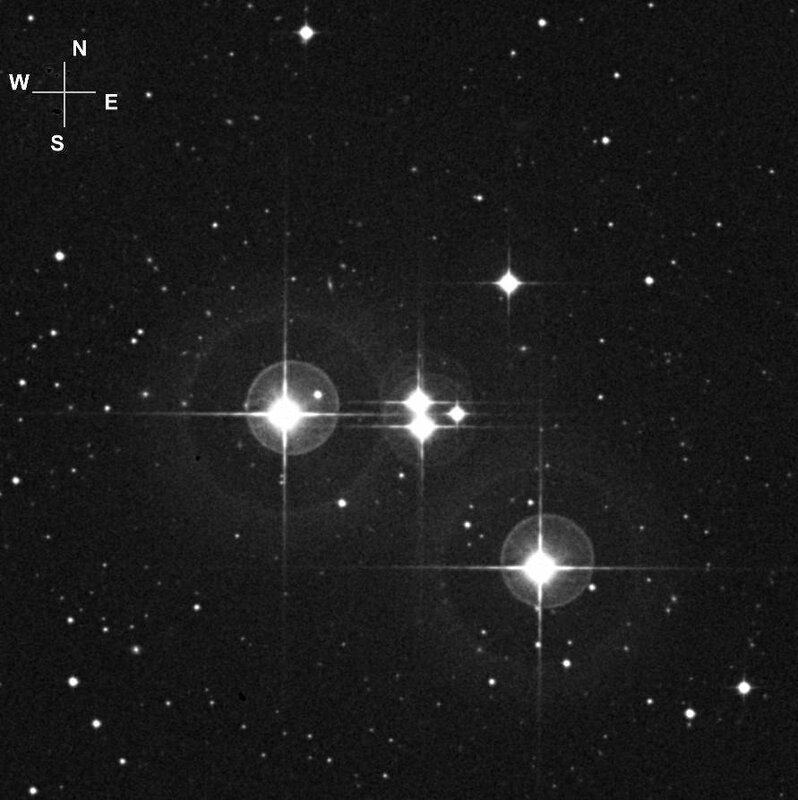 In the 8×50 finder I was using to star hop from Σ 1659, it’s easily seen as a rather tight pair of stars, provided of course you’re looking for it — which I wasn’t, since at the time I was intent on hopping farther west to that other triangle in Corvus, Σ 1604. There are several invisible roads leading to Σ 1664 and M104, shown at the center of this chart. 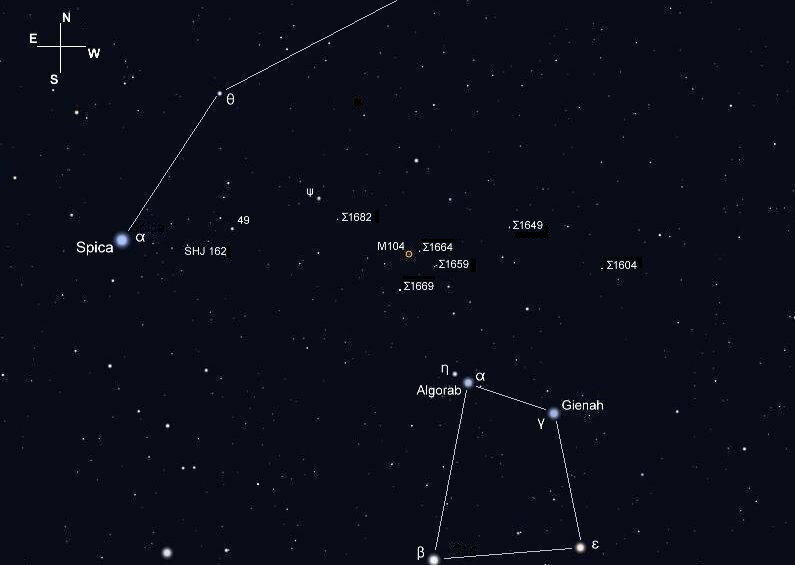 (Stellarium screen image with labels added, click on the chart for a larger view). The northern border of Corvus barely runs beneath M104, so it could just as easily have been a Corvian cap as a Virgo sombrero. And you’ll find several stellar roads that lead to it. If you look closely at the chart above, you’ll see M104/Σ 1664 lies slightly west of a line that runs from Algorab to Theta (θ) Virginis, favoring the Algorab side of the mid-point of that line. You could also start at Spica, leap past 49 Virginis to Psi (ψ) Virginis, then turn to the southwest, directing your aim at Gienah, and come to a stop about a third of the way along that line at M104 or Σ 1664.
you could do what I did, and just make the very short hop to M104 from Σ 1659 (middle right of the above chart) — which if you haven’t seen it, is well worth taking a look at — and even if you have, it definitely warrants another lingering look. Spectral Classifications: “A” is KO, “B” is G5, “E” is G5; All components are non-physical. After a bit of hopping around to ogle a few gems in Corvus with my Celestron four inch refractor, I made my first short jump from Σ 1659 to Σ 1664 and the Sombrero on the 18th of May. Even with a waning moon at about eighty percent of full just starting over the horizon, I could still see M104 with no problem at all. Using a 14mm Radian, which gave me 71x and a field of view of .83 of a degree, I was able to squeeze both M104 and the arrow asterism into the same field of view. The “CD” pair of Σ 1664, which is the tightest and also the faintest of the pairs of stars that make up this multiple, gave me a bit of trouble due to some haze and the rapidly brightening sky, but with a combination of persistence and averted vision, I managed to pry them apart. The next night, when I pointed my six inch f/10 refractor at them — under darker skies and less haze — they were no problem at all. I could even detect a reddish-orange tint in the 7.8 magnitude primary — but nary a hint in the other three stars was to be had. While Σ 1664 and its arrow were holding down the west corner of the eyepiece, the Sombrero was spinning at the opposite side. And a thing of beauty it was, too, in both the four and the six inch refractors. Mainly what I saw was a pale, glowing oval shape with a slight pulse to it — which was due to the earth’s atmosphere, not the galaxy. In the six inch I even had a glimpse of the dust lane that runs through the middle of this huge galaxy, which is classified as somewhere between a spiral and an elliptical. Amazingly, an estimated 2000 globular clusters surround the halo of M104, of which about 1200 have been identified. The distance to the Sombrero is still not fixed — estimates range from 28 million light years to 50 million light years, with the most recent of them leaning toward the lower figure. 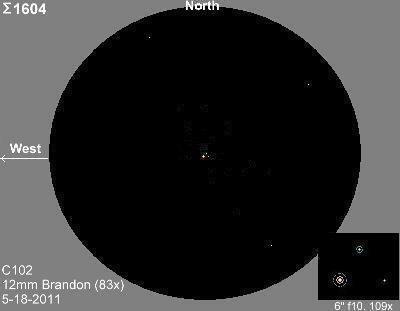 Regardless of the true distance, considering that the primary of the Σ 1664 complex lies 1315 light year from us ….. well, it puts some perspective on the perception of the image in the eyepiece. And before we leave, how about one more quick look? That arrow pointed at M104 also points in the opposite direct to Σ 1649. 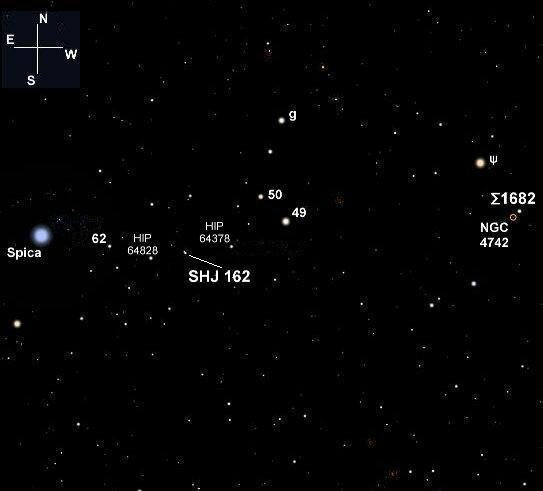 (Stellarium screen image with labels added, click on the chart to enlarge). That arrow pointed at M104 also points in the opposite direction to another pair of stars. 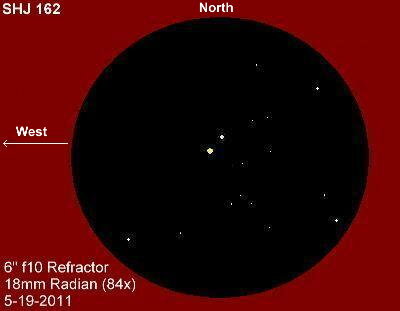 If you follow the arrow’s shaft two degrees to the west, skirting just to the north of an arcing trio of ninth magnitude stars and skimming south of 8.3 magnitude HIP 61255, you’ll find yourself looking at a pair of stars that are slightly brighter than all but one of the four stars that make up Σ 1664. East and west reversed to match refractor view. Click for a larger image. Using my 60mm f/15 mounted on the six inch refractor, the two stars were barely separated in a 20mm TV Plössl (45x). The haze was again smothering the photons fighting to make their way into the 60mm lens, so it was more a case of lack of light making its way to the lens, as opposed to testing the optical limits of the Carton lens in the scope. There are two ways to find your way to Σ 1682. The first — if you’re scope is still pointed at Σ 1649 — is to return to Σ 1664 and M104(making sure not to get caught between the head of the arrow and the galaxy!) — and move northeast about three degrees toward Psi (ψ) Virginis, using the second chart above. Our final two stars are shown on this chart. 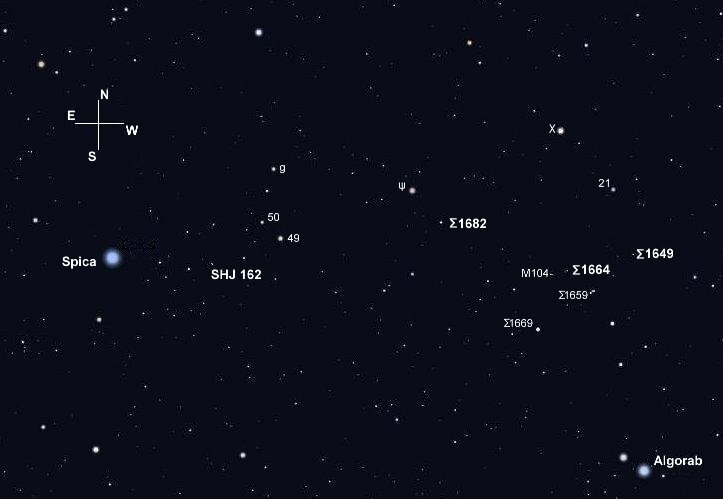 The one we’re looking at now, Σ 1682, is at the far right; and the next one, SHJ 162 lies just to the west of beautiful blue-white Spica. (Stellarium screen image with labels added, click to enlarge). Or, using the chart at the left, start at Spica — pausing a few moments to allow it’s beautiful bluish-white first magnitude light to saturate the lenses of your eyepiece and your eye — and move west, with a slight bias to the north, to fifth magnitude 49 Virginis. Then, with a slight leveling off, continue west for about the same distance, and Σ 1682 should slip into view in a low power eyepiece, which is what it did in my 18mm Radian. In my six inch f/10 refractor, the primary was yellow-white at 84x, and as usual, the 9.7 magnitude of the secondary was too faint for me to make a determination — in other words, no confirmation of the “lucid purple.” The “C” component was also easy to pick out in the six inch refractor, but again, no color. Strangely enough, both Haas and Smyth make no mention of that one, even though it’s not any more difficult than it appears in the photo below. NGC 4742 is at the lower right in this STScI photo of Σ 1682. Click on the photo for a larger view. My 60mm f/15 refractor at 45x had to fight the haze again, but with averted vision I was able to pick out that dim secondary. Haas viewed this one with a 60mm refractor at 35x, and apparently under much better conditions: “Striking contrast! A pearly white star with a ghostly, ethereal presence close beside it.” Under more transparent skies, that sounds like it should fit this one perfectly. 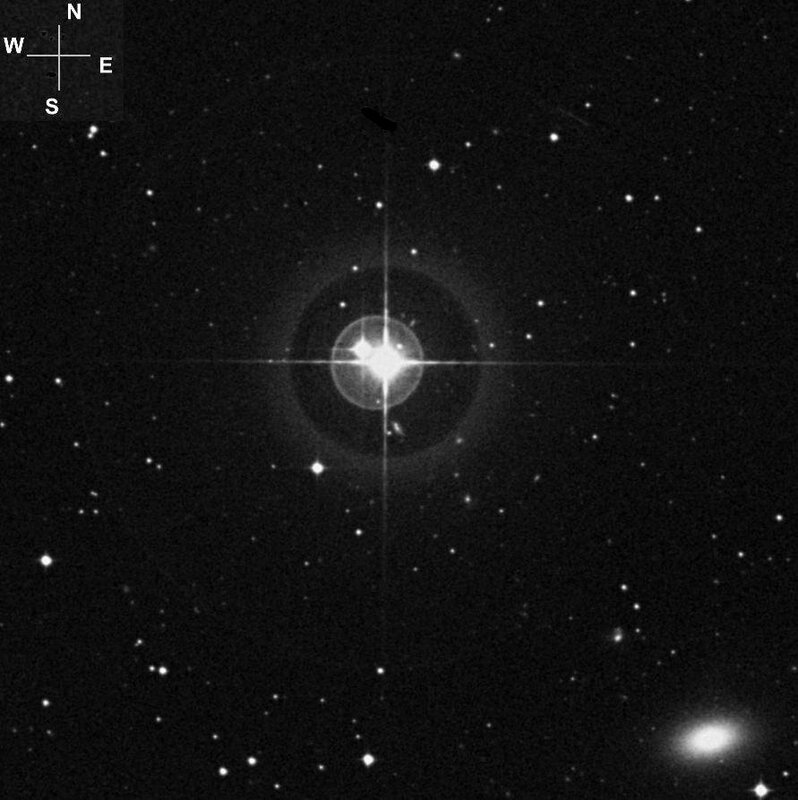 Both Haas and Smyth also seem to have missed the lurking gray shadow at the south-east corner of the eyepiece which is NGC 4742, an 11.3 magnitude lenticular shaped galaxy. It seems to get very little mention in the galactic literature, at least from what I could find in my search for information on its size and distance. At any rate, it’s not alone — 13th magnitude NGC 4760 lies about twenty arcminutes east of it, and you’ll also find 12th magnitude NGC 4781 another twenty arcminutes to the east. So if you’re using six inches or more of aperture under dark skies, don’t be surprised to see a couple of other faint apparitions nearby. This area of Virgo is rich with galactic beauty. And then there’s the mysteriously named SHJ 162, which is easily found two degrees west of Spica. 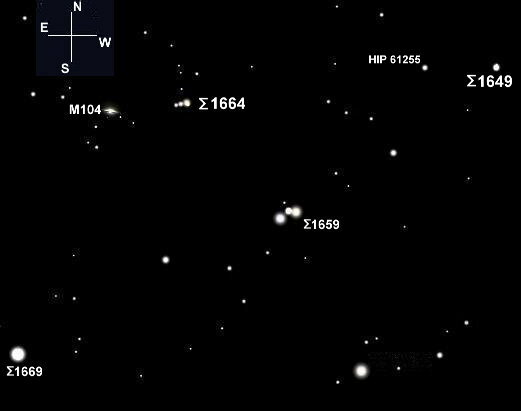 A look at the chart above will show it’s the third of a slightly curved line of four seventh magnitude stars, starting with 62 Virginis and ending at HIP 64378. 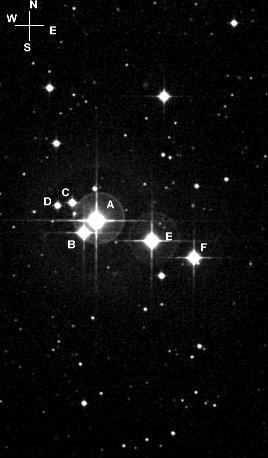 The letter designation, SHJ, is a reference to a catalog of 380 pairs of double stars which resulted from the combined efforts of Sir John Herschel (1792-1871) and Sir James South (1785-1867) in 1824 — you might also see this double referred to with the letters Sh instead of SHJ. East and west also reversed here to match the refractor view. Click … to … enlarge. This pair is ideal for a 60mm refractor, and in fact, probably looks best at that aperture because of the wide spacing. At least that was my opinion of it after comparing the 45x view in the 60mm f/15 to the 84x view in the six inch f/10, although the larger aperture did give me the ability to see more color — yellow in the primary and white in the secondary. There is also a BC pairing here, which consists of 8.2 magnitude “B” and its 13th magnitude companion, “C.” It lies 66.7 arcseconds from “B” at a position angle of 136 degrees, according to figures from 1999 in the Washington Double Star Catalog. 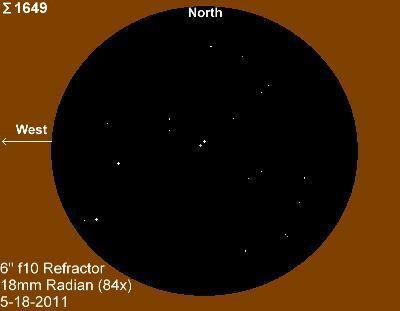 I didn’t see it, however, but with less haze it should be visible in a six inch refractor. And ….. there’s more. The primary also has a 9.1 magnitude companion, “a”, located 0.6 arcseconds away at a position angle of 132 degrees. And I didn’t see it either — it’s a bit too closely spaced for my seeing-challenged sea level location. 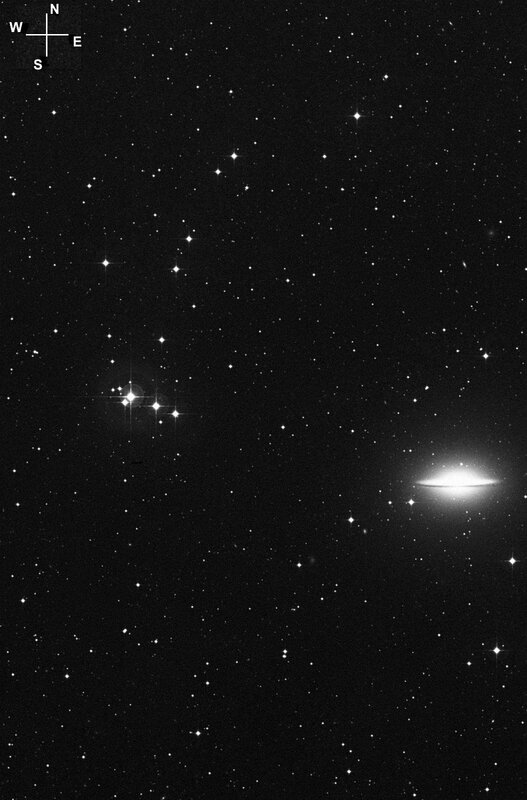 This pair is designated “Aa” and goes by the name Rst 3829, named for Richard Alfred Rossiter (1886-1977) — and it’s just one of the 5534 doubles he is credited with having discovered. (Information on both South and Rossiter comes from the Webb Society Deep-Sky Observer’s Handbook, Volume 1: Double Stars (Enslow), 1986, Second edition). So this is not quite the simple star it appears to be in the eyepiece of my 60mm refractor, being essentially a quadruple star with one name assigned to one half of it and another name to the other half. But there’s always more than meets the eye when you’re ferreting faint photons out of the sky. Which brings this star-hopping and star-splitting tour to a close. Next time out we’ll work our way north to Porrima’s neighborhood, provided I can tear myself away from it’s current close encounter with Saturn. Adios, amigos ……….. and Clear Skies! Thanks for another great post, full of new targets to keep me busy. Just “got” the lovely equilateral triple last night from your previous post plus the “stargate”. As i can only find targets by star -hoping rather than hopping , i do appreciate your detailed diagrams and directions. regards, rich. Rich, those stars in Corvus should be a bit easier from your location than they are mine — should be quite a sight I would think with less haze to gaze through. The view of the Sombrero and Σ1664 ought to be something to see, too. Hope your star-hoping weather has improved since this past winter! Yes John, the stars are maybe 5 to 10 degrees higher in that ESE to SW direction and i don`t suffer too often from haze. Mainly just clouds or clear and sometimes both. After checking Porrima and Saturn to see how high i can push the power-200x- is quite often showing a sharp view which gives a definite hairline split on Porrima, i like to use a wide angle 38x e.p. together with my astigmatism-correcting specs. and hunt down as many of your targets that i can remember at that power. Obviously i have to up the mag. sometimes but really like that e.p. So far the Sombrero does not match S 1664 but might repay a little more effort on my part-maybe tonight! Hope you get clear and steadier skies,regards, rich. Update on the hat with an arrow (nearly) in it. Tried last night to Observe rather than just see-as per the ref. to S. Holmes. Got a lot more out of the “hat”-was a more horizontal than vertical fuzzy.Sometimes obvious directly. More specific result on S1664. Saw the “C” star direct. Averted vision also showed it well.Might have detected the “D” star as a flitting ghost with averted vision.Could easily be wishful imagination as it is right on the limit or above for an 80mm. Anyway the Arrow is now a real 5star sight. Have switched from a 2″ dialectric (Burgess) diagonal to a 1.25″ prism (Baader) and generally seem to get the faint stars directly where before it was only with averted vision (or zilch). Thanks again for the latest “shopping list”. Many regards, rich.